Did Crew Send a Producer to Commit a Felony? Not long after the deceptive editing used in Katie Couric’s “Under the Gun“ was brought to light, it looks like there might be more controversy surrounding the anti-gun film masquerading as a documentary. If you are not familiar with the situation, Couric’s film crew edited in roughly 8 seconds of silence and uneasy glances from gun owners after she asks them a question about how to prevent bad guys from obtaining firearms. To many, this made the interviewees look like “idiots.” What actually happened was that several of the interviewees immediately provided sound, cogent responses to her question. Now, in a recent interview with LipTV’s Ondi Timoner, Under the Gun producer Stephanie Soechtig seemingly admits to sending another producer (from Colorado) to Arizona, where he “was able to buy a Bushmaster and then three other pistols.” Unfortunately, this is a federal crime – despite what Soechtig says – as interstate purchases of long guns must be performed through an FFL in that state (when allowed at all), and interstate purchases of handguns are flatly illegal. We sent a producer out and he was from Colorado. He went to Arizona and he was able to buy a Bushmaster and then three other pistols without a background check in a matter of four hours. And that’s perfectly legal. He wasn’t doing some sort of, like, underground market. As many readers likely already know, to legally purchase a handgun from out of state, the firearm must be shipped to an FFL in your state, and then transferred to the purchaser as usual, including a NICS background check. A number of producers are listed on the film’s credits page, however, it appears that there are only two male names which would match up with Soechtig’s claim that the producer they sent was a “he.” Interestingly, one of the male producers named operates a twitter page listing his location as Denver, Colorado – where Soechtig claims the producer who made the illegal purchases was from. We hope for the sake of the producer and the Arizona seller of the firearms, that what this “documentary” film maker says in the interview is just more lies from the anti-gun left, otherwise she may have just created two new felons! We first caught wind of Assaulted: Civil Rights Under Fire in 2012 when the original Kickstarter campaign was making its rounds. Wildly popular amongst crowd-funders, through the original campaign and the “finishing” campaign, director Kris Koenig raised $148,737 from nearly 2,000 contributions – well over the $135K goal. 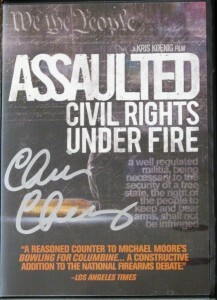 Koenig describes the goal of Assaulted as “educating the public about how their rights are under attack.” A noble goal, given the never-ending attack on the supposedly constitutionally-protected right to keep and bear arms. The film touches on a number of historical events ranging from the 1946 Battle of Athens (TN) to the LA riots of the early ’90s and gun confiscations after hurricane Katrina. Narrated by rapper Ice-T, Assaulted features appearances by Ted Nugent, Chris Cheng, Alan Gottlieb, Alan Gura and others – all rock stars in their own right.